The trouble with recipes is that they can sometimes be misleading. I still get a smile on my face when I remember what happened to this very simple recipe many years ago……. my daughter was about 8 or 9 years old and getting into her stride with baking! On this particular day, I was hosting a dinner party and wanted to make Apple Cake for dessert. 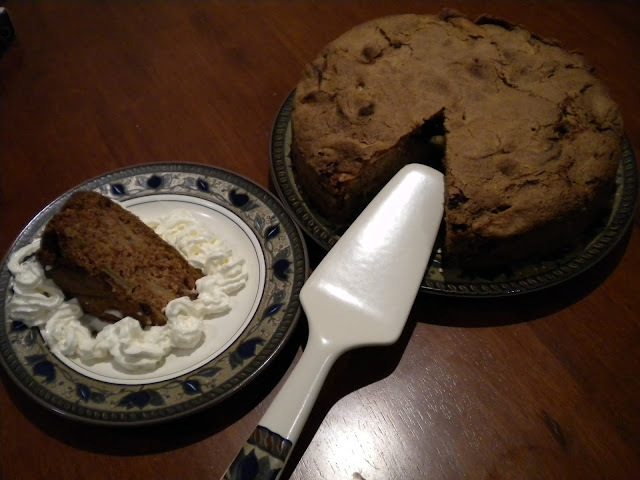 It was, and remains, a superb recipe given to me by a dear friend and apart from its aromatic sweetness, it is one of the healthiest cake recipes I have come across. I had some chores to complete that morning so asked Lucy, our wonderful helper, to gather up all the ingredients for the cake and steep the Apples in sugar, so that it would be ready for baking by the time I got back. I stuck the recipe on the counter, asked Lucy to refer to it for the ingredients, explained what needed doing, and then left the house. When I got back I could not see any steeped Apples anywhere in the kitchen or any of the other ingredients and yet the aromas of sweet Apples and Cinnamon were apparent. Puzzled I asked Lucy where she had kept everything. “Oh, we made it” came the blithe response. “What! You mean you have baked the cake?” I asked. “Oh yes, we did it all. You can see for yourself.”, she responded. “Did you check it with a skewer to make sure it is properly done?”, I asked. “Yes, of course!” came the prompt response. Satisfied with her responses, I went and had a peek at the finished product. Indeed, the cake looked perfect and another skewer inserted into it turned up clean as a whistle. Pleased to have one less thing to worry about, I thanked them both and set about preparing for the evening. Later that evening, after dinner, when the dessert was served, my friend came up to me and asked if I had tasted the cake. I hadn’t, so I asked her what the matter was. She said it tasted very oily. “That isn’t possible, it only takes one-third of a cup of oil!”, I exclaimed. Perplexed, I decided to try some for myself and sure enough the cake tasted and felt very oily. “When did you bake it?”, she asked. “Sometimes, when you bake this cake in advance the Oil can congeal but even then it shouldn’t be tasting like this.”, she said. I then told her how I hadn’t baked it, and we walked into the kitchen to ask the two Sous-Chefs what had happened. “Could you tell me how much oil you used because the cake tasted a bit oily?”, I asked. To which they proudly responded: “We knew you do not like too much oil so we only used one cup even though the recipe said one or three cups (1/3)!!!!!!!!! 4 Cups – Cored and Sliced Apples (fairly thin slices) – I leave the skin on but that is a choice you can make for yourself. Serve hot with fresh Whipped Cream or Ice Cream. Yes you can use wholemeal flour without a doubt as I have done that, in fact I have even used atta when nothing else is around and that works well too...the rest you can tell me when you've done it! looks yummy ! thats a great recipe !